FRANKIE MORENO – UNDER THE INFLUENCE celebrated its opening night performance on May 4, 2016 with a passionate full-house inside the newly renovated PH Showroom at Planet Hollywood Resort & Casino in Las Vegas. Named ?Las Vegas Headliner of the Year? two-times running, Moreno marked his return to The Las Vegas Strip with the debut of UNDER THE INFLUENCE. 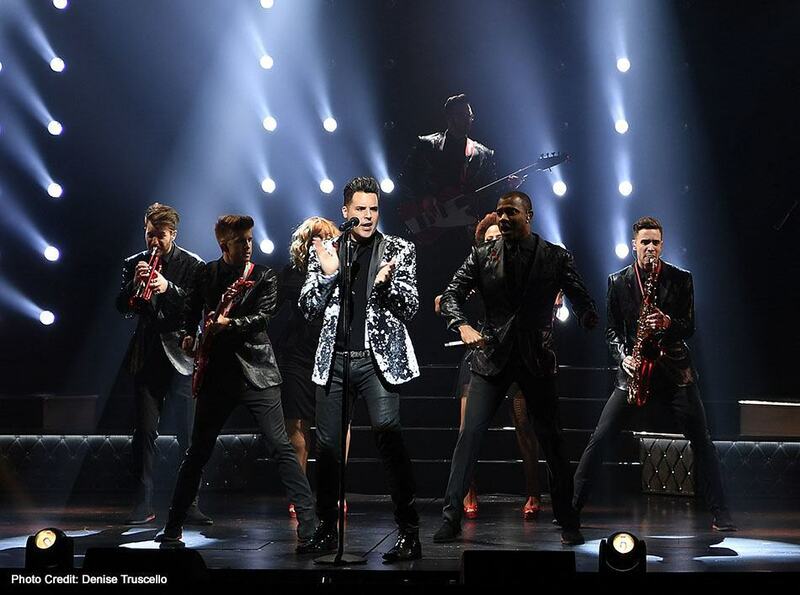 Pairing unmatched versatility with a state-of-the-art, fully-choreographed production, Moreno and his band entranced audience members with a high-energy performance of original songs like ?Diva? and reimagined covers of hits such as Michael Jackson?s ?The Way You Make Me Feel,? bringing the audience to their feet with tremendous applause at the finale of the 9 p.m. show. Following the performance, Moreno, Dancing With the Stars professional and featured performer Lacey Schwimmer and the band were greeted by guests in the Showroom lobby, sharing words of congratulations and laughs with the group. Notable names in attendance at the opening night blue carpet and performance include Motley Cr?e frontman Vince Neil, Chef Rick Moonen, So You Think You Can Dance Season Two winner Benji Schwimmer, Robert Diggs aka RZA of Wu Tang Clan, Madam Secretary star Erich Bergen, Olympic figure skater Jeremy Abbott, Las Vegas headliner Clint Holmes and others. Featured members of UNDER THE INFLUENCE include bassist Tony Moreno, guitarist Alexander Zeilon, trumpeter Chris Massa, drummer Peanut Butter, saxophonist Fabricio Bezerra, and vocalists Markevius Faulkner, Crystal Robinson and Ashley Roberson. FRANKIE MORENO – UNDER THE INFLUENCE is now electrifying audiences nightly inside the PH Showroom at Planet Hollywood Resort & Casino Wednesday-Sunday at 9 p.m., with a new schedule of Tuesday-Saturday beginning June 5.